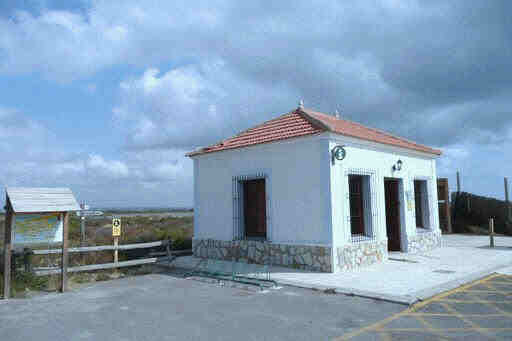 Lo Pagán ( 1.6 km from San Pedro del Pinatar ) This is the ideal place for your stay. But get your booking in early. 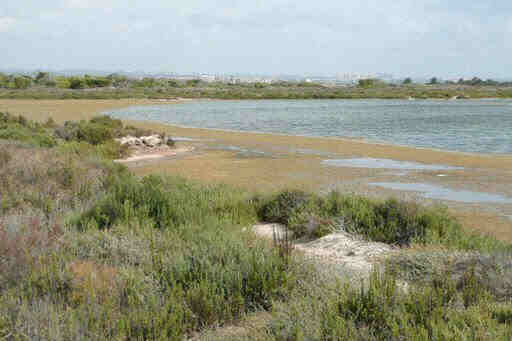 The salt flats in San Pedro del Pinatar form the most important wetlands in the entire region. They were declared National Park in 1985. 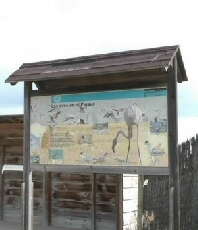 Every year flocks of flamingos and other migratory birds nest here and use this national space as their connection between Africa and Europe. 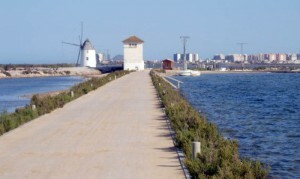 San Pedro del Pinatar lies at the northern most end of the Mar Menor and is the first town in Murcia after you cross the border from the Valencian region. To access the park take the exit sign posted San Pedro playas from the roundabout decorated with a fishing boat on the N332. 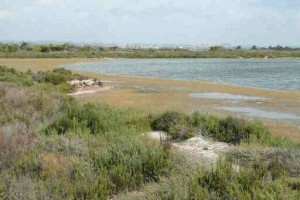 The Mar Menor, or small sea, is one of the largest natural lagoons in the world. 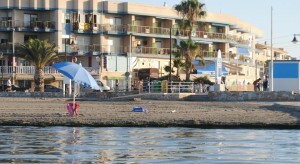 It is formed by the main coastline and the sand bar of La Manga, which separates it from the sea. Being only a maximum of 7 mts deep the water remains relatively warm throughout the year and so is known as the largest swimming pool in the world. 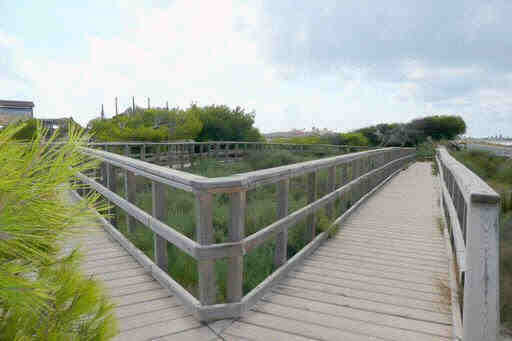 The san pedro del pinatar park is a very fragile and delicate ecosystem, so please make sure you only walk around the specified areas, do not step on the dunes or the vegetation or bother the birds. It is forbidden to take unleashed dogs, make bonfires and camp outside the authorised territories. Using a pair of binoculars you will get a better view of the birds. In was in May 1992 that the EU governments adopted legislation designed to protect the most seriously threatened habitats and species across Europe. This legislation is called the Habitats Directive and complements the Birds Directive adopted in 1979. At the heart of both these Directives is the creation of a network of sites called Natura 2000. The Birds Directive requires the establishment of Special Protection Areas (SPAs) for birds. The Habitats Directive similarly requires Special Areas of Conservation (SACs) to be designated for other species, and for habitats. Together, SPAs and SACs make up the Natura 2000 series. All EU Member States contribute to the network of sites in a Europe-wide partnership. In total Spain currently has 563 SPAs covering 97,123 Km2. Description of the route: there are two itineraries. 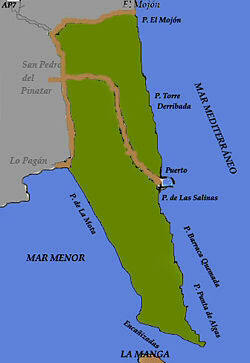 The first one goes from the parking next to the road from San Pedro del Pinatar to the port. There you will find a centre that will provide you with maps and information about the flora and fauna you will find in the park. The route marked goes around the lagoon and a fauna reserve until reaching the beach. Further on towards the north, the road goes back into the dunes, passes the onlooking tower and, after going round the pine tree forest, it reaches the road and the parking area again. 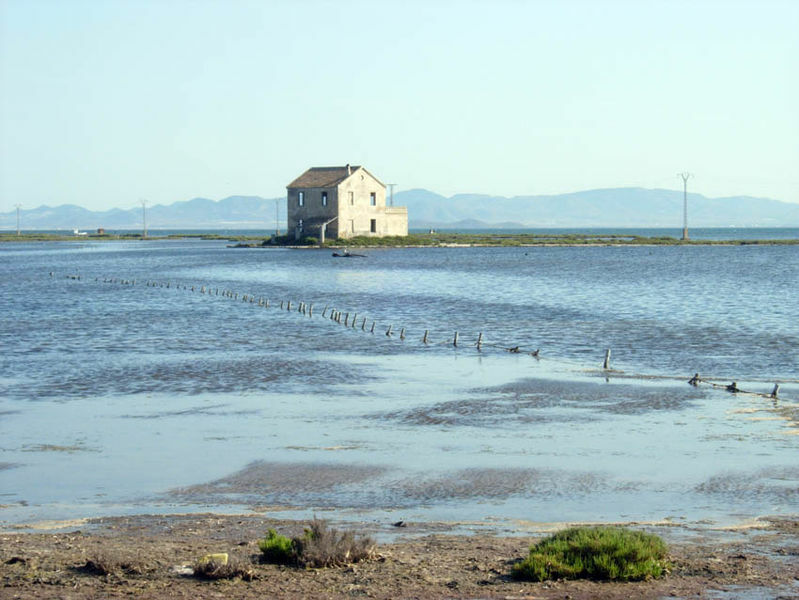 The second option allows you to visit the southern part of the salt flats and the “encañizadas” of the Mar Menor. It starts from La Calcetera windmill, which can be reached walking along a path that starts from Quintín windmill and uses the strip of land that separates the salt flats and the lagoon. 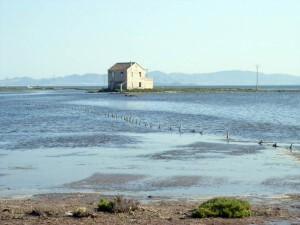 From La Ezequiela, a little road goes around the salt flats and reaches Punta de Algas beach in La Llana. Don’t only focus on the water keep you eyes open amongst the tree and vegetation areas as well. There are plenty of mammals and reptiles including red-tailed lizards and pygmy white-toothed shrew. The beach, Playa Torre de la Derribada, can be directly accessed from the car park via a wooden decked path, but for Mar Menor beaches you will need to drive a little further south. San Pedro has plenty to offer sightseers or maybe a few hours relaxation in the Thalasia Health Spa complex offering lots of different treatments. You can also like to try a mud bath, which is reputed to have therapeutic qualities, especially for sufferers of muscle related problems. The Dos Mares shopping centre,which is even open on Sundays, is located to the southern end of San Pedro on the N332, will suit those needing a fix of shopping. There are many bird species, although the most spectacular ones are flamingos, who arrive in flocks at the end of the summer to spend the winter here. You can also see plovers, herons, barn owls, gulls, harriers and avocets, amongst other species. Salt flats have been in this area for as long as we can remember. Documents from the 14th century already mentioned them. 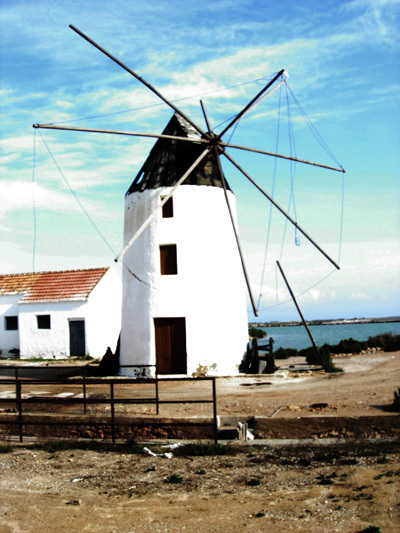 The two windmills that are still standing were used for many years to extract the water from the Mar Menor into the storage lagoons. Today they have been replaced by electric pumps, but their silhouette is still an important element of the landscape. 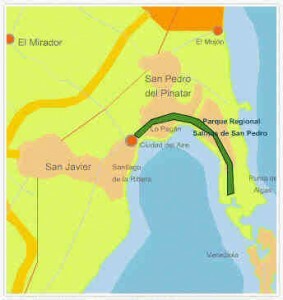 PARK FACT FILE Regional Park San Pedro del Pinatar. FACT FILE San pedro del pinatar. Location: Accessed via N332 San Pedro Playas exit. Paths: Fairly flat but sandy. WCs: Located in the car park. You are in a protected wildlife area with nesting birds. Keep dogs on a lead. To contribute to its preservation visitors should attempt to come in small groups, make as little noise as possible, not leave the paths marked out, respect animals and plants, not light fires, respect forestry rules, and leave no rubbish, waste or tracks of your presence along the route. Produced with the backing of SEO/BirdLife and the collaboration of over 200 Spanish ornithologists, all of whom share in-depth knowledge on the birds of their respective local areas, this work includes over 200 itineraries detailing habitats of interest for birds: mountains, woodland, grassland, agricultural zones, steppes, riverbanks and gorges, wetlands, coasts and even urban areas. All areas referenced on high precision maps, especially designed for this project. This title also includes lists of the most representative species for each site, as well as practical information and useful tips for birdwatchers.